loved those dinner plate blooms. i will be back to order ore. The Pee Gee Hydrangea, which is native to China and Japan, is the most common of the hydrangeas found in yards and gardens. This hydrangea is a shrub that can also be grown to look like a tree with the appropriate pruning and training using a staked stem. This versatility makes it very desirable and adds a unique quality to a beautiful plant. 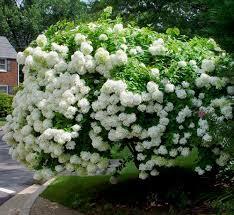 It is sometimes called the “tree hydrangea” because of this particular ability. This hydrangea is lush with dark green leaves that grow oval and whorl towards the tips of the leaves. It blooms from July to September, unleashing a bounty of creamy white flowers that create cone-shaped panicles. The flowers turn into a lovely shade of light pink over time and give off a strong, sweet scent. Thinning of the plant can lead to an increase in the size of the flower panicles. The branches of this plant start in the center and reach out in a fountain formation. This gives it a plush appearance when it is not pruned as a tree. The bark is a brown color with a hint of gray, but it is not very visible if the plant is not pruned.The fast growth rate and density of these hydrangeas make them ideal as hedges, but they also work well as eye-catching lawn specimens when trained to grow as small trees. Pee Gee Hydrangeas are showy plants that can add character to any yard. The Pee Gee Hydrangea Bush is probably the hardiest plant in the Hydrangea family. It does well in colder climates and is easy to grow. The plant blooms from mid to late summer. It blooms form a new growth. They do well for the experienced gardeners or for the newbies who need a plant that will do well for them. This Hydrangea would be kind to all.The bloom of the Pee Gee Hydrangea is a snow white that turns pink with age then to rust colored in the fall. Unlike other Hydrangeas that have round flowers, this variety has cone-shaped flower clusters. The flower heads reach six to eighteen inches long and make a magnificent display.Some of the benefits of growing this beautiful plant are that it works well in flower beds or placing them as borders. They are excellent for cutting for indoor display or do beautifully when dried.Suffice it to say that the beauty of this plant would put on a show that would beautify any area in which it lives. Beauty is in the eye of the beholder, and this Hydrangea would undoubtedly be beautiful to behold!